A colleague recently attended the Fromm Petfest in Milwaukee, sponsored by Fromm Family Foods. She came back not only excited about the day and the event activities but also brimming with product samples collected during her visit. 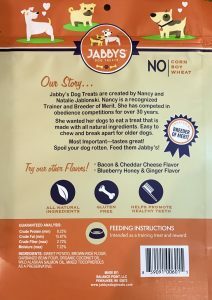 One product, in particular, caught my attention, Jabby’s Dog Treats. So many things were done well with the packaging design that I couldn’t help but be pulled into the package and drawn down through the copy in a very crisp, logical read. The content was organized into a natural flow of communication that with each point bonded me further to the intent and composition of the product. As a consumer committed to selecting the best possible product for both the humans and pets in my family, it was very easy to connect and understand the ingredients. The clear window on the face panel also gave me an easy and immediate view of the actual product. To me, what works particularly well are the visual cues that balance the copy on the package. They are effective to the point that technically, even without words, you are still able to construe the nature and use of the product – the small bone denoting size, which is reflected in the actual product shown in the window; the cute illustrations of the two different size dogs; and the fish icons representing salmon in the window revealing the flavor of product inside the bag. The copy acts as much as a technical enhancement of the images as it does a stand-alone component. Lastly, the design grid is uniform between the three flavor variations, offering strong brand consistency. With all that said, I do have a few recommendations on how I would further strengthen the packaging. Regarding the communication grid, instead of uniformly positioning the flavor icons in the window-exposing product, some are positioned outside of the window area and in inconsistent locations. While color has been used to distinguish flavor variations, icons aid the consumer in clarifying flavor – I would position all the flavor icons consistently so the consumer doesn’t have to search around the package to find them. Additionally, I noticed an awkward shadow behind the Jabby’s brand where a serif has remained when modifications were made to the “J” in Jabby’s – so it appears that an error was made in the printing. If this were intentional, it would be good to clarify as this is important to brand image. My final comment has to do with the violator. As the owner of mixed breed rescue dogs, I was unsure of its purpose and message and didn’t see the compelling value. If this product were distributed exclusively to breeders/trainers it would probably have more meaningful relevance. I believe the focus should be on the all natural, healthy, additive-free benefits of treats for any dog in training. It is clear that a great deal of thought went into the creation of this packaging. The resealable aspect of the bag makes it convenient to transport and use, and the gusseted bag stacks and stores well on shelf. I also appreciate the matte surface, which eliminates potential glare from reflective lighting in a retail setting. I cannot attest to the taste, but I know that my dogs love anything that resembles salmon, blueberries or bacon. While they are not show dogs, they do respond well to treats they fancy, and I know Jabby’s will hit the mark. If you have a product that you would like to market to pet parents, we can help. Throughout our 60 plus years in supporting customers with consumer brands large and small, we apply our experience and expertise to the entire process to create efficient and effective solutions. To start a conversation, contact us at 920-886-7727 or info@brand-directions.com. 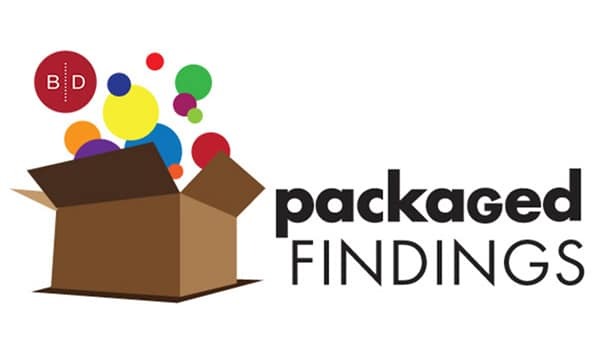 The purpose of our “findings” blog is to spotlight packaging that displays thinking that breaks the mold delivers something new or chancy – or at the very least, highlights packaging that catches your eye in the retail environment.